I had planned to write about my new iPhone 4 in the Bangkok Post, but as none of the carriers obliged I instead looked at the four Macs in my hands during a period of about four weeks in August and September. I know the title says five: read on. I also did find an iPhone 4 with no help from the carriers, so in the end did write about that as well: coming soon, as they say. The story begins and ends, of course, with the 15" MacBook Pro that performed so well for its first four months and then slipped down the scale as, apparently, its hard disk went into self-destruct mode. I am surprised by this in a couple of ways: the SMART status (Self-Monitoring, Analysis, and Reporting Technology) gave no indication that anything was amiss; and scores of owners of the same i7-equipped computer are showing a range of other problems that seem to lead to the frustrating freezes. On the other hand, hard drives do break (and computers are stolen) so it is as well to make sure that data is always backed up. 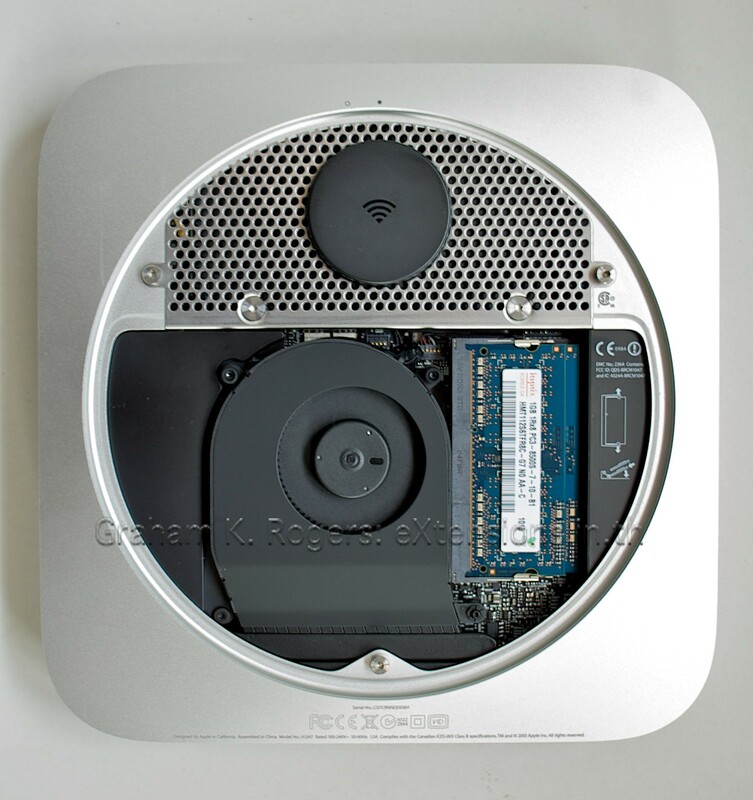 At the time the MacBook Pro began to misbehave, I had a new 2.4GHz Mac mini for a couple of weeks for review. Despite its diminutive size, it is a hard working machine and capable of absorbing anything I could throw at it. Its size made it easy to carry around, but the lack of a monitor, caused me to come up with a couple of unusual solutions: at my home I used the TV; and at work I carried an extra monitor to classrooms with the two display ports certainly helping there. When the MacBook Pro died, the loan period for the review was extended by Apple's local office and I switched operations to that, although did not install Aperture. I made do with iPhoto and some other graphics software and stored the original images I had taken in a folder for later import into Aperture. The period that I was without a notebook computer was extended, perhaps due to a communications error, and while the Mac mini was doing the job, it was not mine and was not organised as I wanted: it was like living in a hotel room while your apartment is being redecorated. Using the cash I had earmarked for the iPhone 4 (or the iPad, which is still not on the horizon), I ordered a 13" MacBook Pro from the Apple online store which arrived within a couple of days. I was able to bring that 99% up to speed within a couple of hours, using the Time Machine backup to transfer data and settings from the broken Mac, then copying over the recent data from the Mac mini. 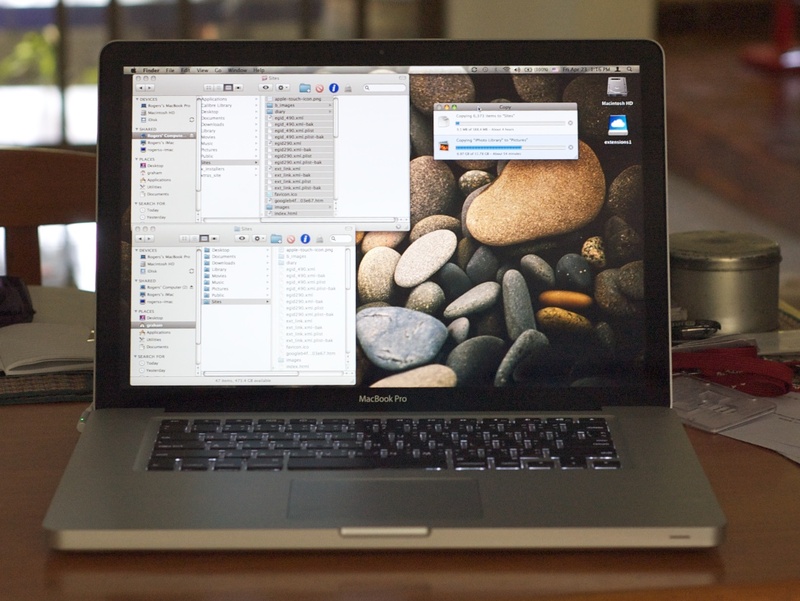 That Time Machine backup then became the 13" MacBook Pro backup, giving me almost-seamless access to all the data I had created on the 15" Mac, and by extension all the data (some going back years) that I had transferred to that when it first arrived. After a week adjusting to the smaller screen I found I was quite happy with this computer which uses the same Core 2 Due processor as the Mac mini, which was one of the reasons I had opted for this version. However, at the end of that week (7 days exactly) the repaired 15" Mac was returned to my office with a new Seagate 500G hard disk. I have been (naturally) quite wary. I was too busy to switch back at that time and make it my main computer, and in any case, I wanted to make sure that the hard disk had been the problem. I turned it on and left it running in my office for a few days before risking it. I had also by then become quite fond of the 13" MacBook Pro and was having a serious debate as to which of the two I should use. I am a sucker for power, so after several days of uninterrupted running, I switched back to the i7 Mac, again using the Time Machine backup to effect the switch. Almost a week later I am writing this on the larger machine which has not missed a beat. There are five computers in this tale, and the silent partner, if you will, has been the 20", 2.4GHz iMac (that same Core 2 Duo processor) that sits upstairs im my home office and has gurgled along for the last two and a half years without being turned off, apart from normal updates and once when the cleaning lady was over-enthusiastic with her mop. Along with the Mac mini, this also served as a totally reliable reserve machine at home and carried another complete data backup. The iMac stays of course; while I wiped the Mac mini and returned it to Apple, which left me with two Mac Book Pro computers. As the i7 now appears stable, this has to be my main machine. When a friend saw the 13" one I was subjected to a pseudo-Gollum act: the 13" MacBook Pro was the substitute Ring and I was pressured into this becoming an early Xmas present with the covetous glances and envious comments. I debated about selling it, or keeping it as a spare (that thought lasted about 10 seconds), or even renting it out, but practical considerations took over (as well as the personal). If I sold it now, I would perhaps still be pressured into a new Mac for Christmas and the chance to do a little good now rather than later took over. The older 2.16GHz MacBook Pro that I had passed on was brought to my house as well as the 250G LaCie hard disk that had been used for backing up. I made sure that was done again, then updated the software on the 2.16Ghz machine. 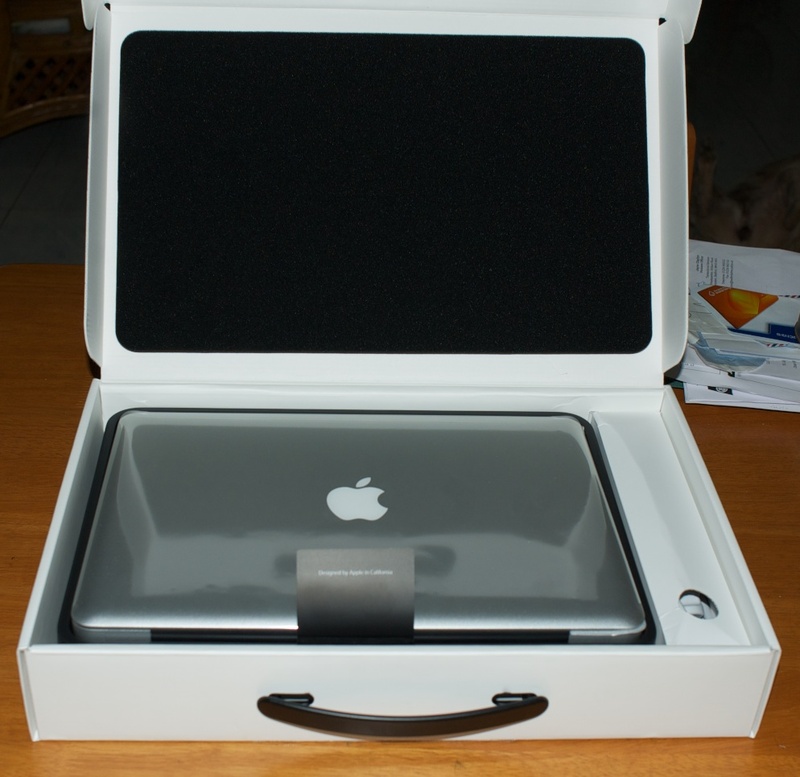 At that stage, I produced the box containing the 2.4GHz MacBook Pro and became superstar in my own house. With all my data on the 13" Mac, I wanted to clean the whole thing off again, and reinstall OS X, so that the new owner would be starting with a new system. At least that was the idea, as Time Machine was my suggested route. Instead of using the Erase command from the Install disk as before, I repartitioned the disk: from one to one partition, and renamed the disk. The operation took a couple of minutes and we went on to install OS X, which I have done more times this past month than the last 5 years. With time dragging on, we took a break and I ordered a rare pizza. At the end of the process, the panel appeared offering to transfer data, but there was a snag. The hard disk only had Firewire 400 ports, while the new Mac only had one FW 800 port. We switched to the Migration Assistant, but running this from the Install disk seemed a better option than a later transfer. It took well over an hour, but then I had to update OS X to 10.6.4 as well as add a number of other updates to security and applications that had appeared recently. The last item was the iPhone. My friend's 3Gs was recognised immediately and the necessary transfers took place with no loss of data although as the apartment building has limited wifi, the Macs are connected to the Internet using Bluetooth and 3G, which works in that area of Pechakasem Road, perhaps because it is near a major hospital. The iPhone had connected properly via the USB cable, but would not work with the Bluetooth method. We had to pair, disconnect and pair again a number of times, until I checked the network preferences. There was an item for Bluetooth DUN, but not Bluetooth PAN. I added the item and we were online instantly. After a few final checks, the two Macs were packed into a bag along with the LaCie hard disk and some other cables that might be useful and a taxi was called. Thus far there has been one phone call to confirm settings. Otherwise all seems to be well, while I am back to a more sensible two Macs in the house, but I did manage to add an iPhone 4 the following day.